A Well-Feathered Nest: These aren't your grandma's diapers! These aren't your grandma's diapers! 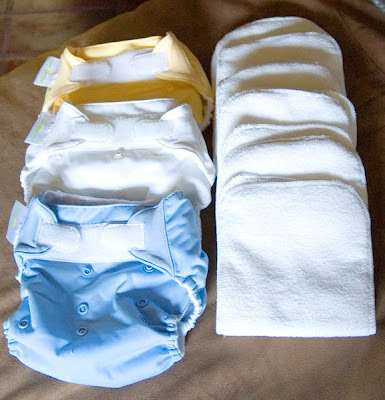 I imagine that there are a few people out there who are a bit frightened by the fact that I have mentioned that we plan to use cloth diapers this time rather than disposables. When I first realized that there were people out there who still use cloth, I was a bit weirded out myself. I think I read something about it during one of my previous pregnancies--after Jonathan, of course. I learned then that there are all sorts of new things out there, but it all sounded overwhelming and like it would be pretty expensive. So I pretty much put it out of my mind. Well I do remember the frustration of having to buy diapers of some sort for 3 1/2 years because someone around here was terrified to sit on the potty. Those things definitely add up after a while. So, thanks to a nice mama in our Classical group who decided to tell me all about how she used cloth when her daughter was a baby (and she made it sound relatively easy) I decided to give it some more thought. The rising prices of almost everything probably helped to give me a little nudge as well. The best I can remember, we were spending at least $15 every 2 weeks on diapers, and that was for Luvs near the end when they definitely don't go through nearly as many diapers as they do at the beginning. It may have been closer to $15 every week at the beginning. Multiply that by 3+ years, and it gets to be a pretty big number. That's where my mission began. First, I wanted to sit down and try to determine just how much money it would save, and get an idea of how much work would be involved. I discovered that there are sooo many more options out there than when I looked into it before. Apparently a whole world of work at home mamas who make and sell diapers and supplies online has evolved. There are multitudes of things to choose from. And someone came up with a great thing called a diaper sprayer that hooks to your toilet and means you never have to do that dunking thing that you may have read about. I learned really fast that I was looking for cheap and simple. It's funny because after learning about all the fancy stuff out there, I did pretty much decide to keep it old school as some would say. For the most part, we will be using prefolds and flats with some pins but mostly a great new invention called the Snappi. Then there are lots of covers to choose from with those. Most of the ones we're starting with are made of a material called PUL (I don't remember what it stands for just now) which is waterproof. Why did I decide on these? The first reason was that they are definitely the cheapest and most versatile choice. Because you're folding them, you can get a good fit no matter how your baby is built. Another reason is that they seem to be much easier to care for. Washing isn't as complicated, and it takes less time (and energy) to dry them. Pretty much, if you can learn how to put them on and get a good fit, you're good. But those are like your grandma's diapers. Once I started thinking things through, I decided I should probably figure something out so all the people in the nursery at church aren't scared away. I think I have come up with a pretty good solution. I stuck with something pretty mainstream as far as diapers go, and they are BumGenious diapers. These are considered a pocket diaper because they have a pocket on the inside where you stuff absorbent inserts. You can put in as little or as much as you need. With these, you use them one time and then they must be washed. So you do need as many as it takes to get you through until time to wash. That's not quite as intimidating when you're just looking at a few hours a couple of times each week. They are much easier for the person doing the changing because they go on and come off just like disposables. They just go in a wet bag instead of the garbage at the end. Another bonus of the ones we chose is that they are considered one size. They have snaps that allow you to adjust the sizing to fit your baby for a long, long time. And a special thanks to Nana for ordering the ones you see for us. Some people choose to use pockets or similar diapers all the time, but I actually like the idea of keeping things simple. Plus, since my first goal was to save money, it just makes sense. I was able to find a coop for the prefolds and flats, so I got a lot for not so much. We shouldn't have to get more of those for a while. And if the flats work out, we could possibly make it through to the end with maybe another dozen of those and some bigger covers. I just thought I'd share a little bit about what we have planned, and I hope it may not sound so scary now. Also, I'd love to answer questions if anyone has some. And just for kicks, how about a pic of what you might choose if you wanted to pamper your babe rather than save money? Keep in mind this is only one example of many, and I can totally understand the cuteness factor of these. They are just a bit out of my price range.